Hinshaw, William L., age 28, born in Indiana; $400 personal property. Hinshaw, Ruth, age 29, born in Indiana. Hinshaw, Rosanna J., age 10 months, born Aug  in Indiana. Hinshaw, Aseneth, age 61, born in North Carolina; $1800 real estate; $50 personal property. Hinshaw, W.L., age 37, born in Indiana; parents born in North Carolina; farmer. Hinshaw, Ruth, wife, age 38, born in Indiana; parents born in North Carolina; keeping house. Hinshaw, Rosanna J., daughter, age 10, born in Indiana; parents born in Indiana; attended school. Hinshaw, John H., son, age 9, born in Indiana; parents born in Indiana; attended school. Hinshaw, D.Z., son, age 8, born in Indiana; parents born in Indiana; attended school. Hinshaw, J.W.D., son, age 5, born in Kansas; parents born in Indiana. Hinshaw, Anna M., daughter, age 3, born in Kansas; parents born in Indiana. Hinshaw, Asenath R., daughter, age 2, born in Kansas; parents born in Indiana. 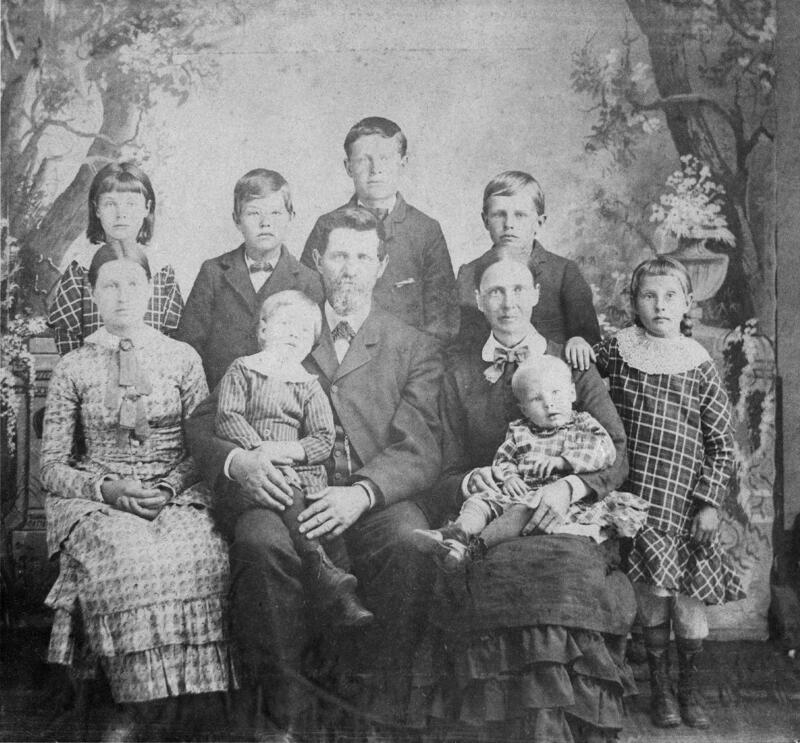 Hinshaw, William L., head-of-household, age 57, born Feb 1843 in Indiana; parents born in North Carolina; married 1 year; occupation: minister; rented home. 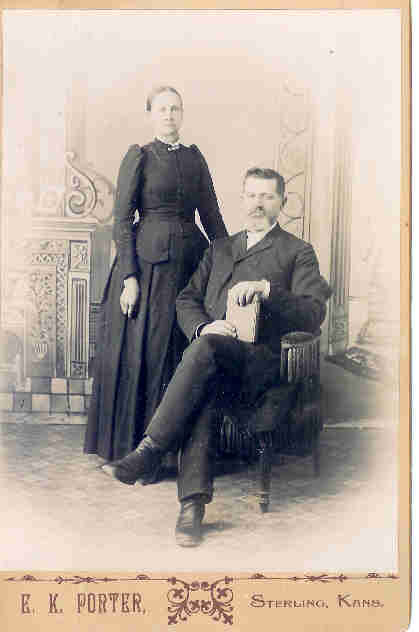 Hinshaw, Hattie E., wife, age 34, born Oct 1865 in Ohio; parents born in Ohio; married 1 year; 1 child, 1 living. Hinshaw, Jonathan D., son, age 25, born July 1874 in Kansas; parents born in Indiana; student; attended school 8 months. Hinshaw, Aseneth R., daughter, age 22, born Feb 1878 in Kansas; parents born in Indiana; attended school 9 months. Hinshaw, Amos R., son, age 18, born Feb 1882 in Kansas; parents born in Indiana; attended school 9 months. Hinshaw, William L., head-of-household, age 67, born in Indiana; parents born in North Carolina; third marriage, married 4 years; occupation: clergyman; rented home. Hinshaw, Rachael H., wife, age 60, born in Indiana; parents born in North Carolina; second marriage, married 4 years; 8 children, 3 living. Hinshaw, Mary E., step-daughter, age 32, born in Indiana; parents born in Indiana; single; occupation: clergy. Hinshaw, Elva R., step-daughter, age 20, born in Indiana; parents born in Indiana; single. Hinshaw, Marth L., step-daughter, age 34, born in Indiana; parents born in Indiana; single; occupation: stenographer. Hinshaw, William L., head-of-household, age 76, born in Indiana; parents born in North Carolina; owned home; occupation: minister, United Brethren. Hinshaw, Rachel, wife, age 70, born in Indiana; parents born in North Carolina. Hodgin, Martha, step daughter, age 43, born in Indiana; parents born in Indiana; single; occupation: bookkeeper, machinery co.
Died at his home in Sterling, Kansas, Friday, March 14, 1924, in the 81st year of his life. Funeral services will be held from the M. E. church, Monday, March 17, 1924, at 2:30 p.m.; conducted by Rev. C. V. Priddle assisted by Dr. Spencer and Rev. Wilkinson. Hodgin, Martha, head-of-household, age 54, born in Indiana; parents born in Indiana; single; owned home ($2500 value); no radio in home; occupation: bookkeeper, hardware store. Hinshaw, Rachel, mother, age 80, born in Indiana; parents born in North Carolina; widow. 1870 census, Winchester P.O., Washington Township, Randolph County, Indiana; roll M593-354, page 460, line #37, dwelling #368, household #368. 1880 census, Medford Township, Reno County, Kansas; roll T9-0394, ED 287, page 482B, line #17, dwelling #168, family #171. Indiana Work Projects Administration, 1941; book C-V, pg 352. 1910 census, Valley Township, Reno County, Kansas; roll T624-453, ED 138, page 18B, line #79, dwelling #141, family #143. 1920 census, Sterling, Rice County, Kansas; roll T625-547, ED 206, page 3B-4A, line #99, dwelling #93, family #93. 1930 census, West Ward, Sterling, Rice County, Kansas; roll T626-717, ED 19, page 18B, line #59, dwelling #487, family #504. 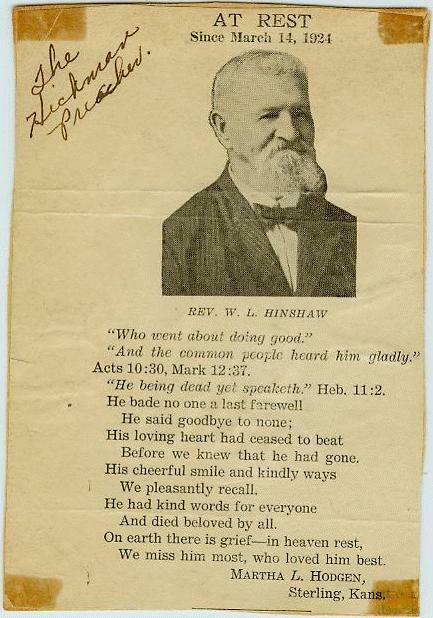 Memorial card from the funeral of William Lawrence Hinshaw. Photo courtesy of Phyllis Long (). Photo courtesy of Joshua Smith ().